We started making spike drivers in the 1940’s and have been perfecting them ever since. Our rebuilds are like new. We rebuild equipment from the frame up, extending the usable life of your machine. Leaders in rail flaw detection. Our flexible rail flaw detection options make it easy for you to keep your track safe. Our Shuttlewagon mobile railcar movers can navigate up to 70 degree track curvatures. 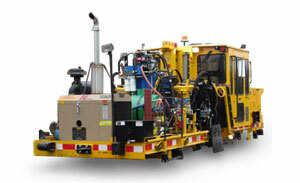 The RoadReady™ Surfacing Team is the most mobile surfacing equipment in the industry. Tie renewal gangs. Rail renewal gangs. Track surfacing gangs. Right-of-way clearing teams. If you have these teams, we make the equipment you need. We rebuild from the frame up, resulting in a like-new machine. Talk to us about how we can extend the life of your assets with our rebuild program and parts availability. Rail flaw detection services and vehicles. Wheel inspection. Rail-bound rail inspection. We lead the field in ultrasonic non-destructive testing (NDT) equipment. Nordco is growing rapidly and we're looking for a variety of professionals to fill open positions. Search our listings to find your fit. Shuttlewagon mobile railcar movers. Superior rubber tire traction. Widest range of drawbar pull ratings. We are your choice for moving railcars in all industries. Nordco launched the RoadReady™ Surfacing Team to an audience of over 100 railroad professionals at a customer Open House. The RoadReady™ RST-1000 Production Switch Tamper and RBR-1000 Ballast Regulator form a mobile Surfacing Team that individually attach to over-the-road tractor-trailers for easy transport between job locations. Our CylSonic systems are the leading ultrasonic non-destructive testing options for requalifying cylinders. Our systems are DOT and Transport Canada certified. Watch the video to learn more.